All stainless steel and using S.W. Farberwares's patented "Superfast" perk system. Its the same one used today on the pots made in China which don't last and have crappy SS. This model, made in NY, N.Y. was made to last and does. It is all refurbished and ready to go another 20+ years!. Ceramic insulator with spring. All automatic, all nice and hot, all ready to make the best coffee you ever had. Plastic OEM perk top. Gold label. I don't get many of these and they don't last long in the store. I think its the best size and best constructed of the Farberware percolators. I just found out today that the pot is from the 50s & not 60s as I thought. My 138 finally burned out this past weekend (sept 2017) How is that for service! Anyway I am glad I found this site, I will be purchasing the parts needed and renewing this little gem for another generation. It really does make the best coffee. Just purchased this item and have used it once. It is in like new condition and the coffee was perfect. 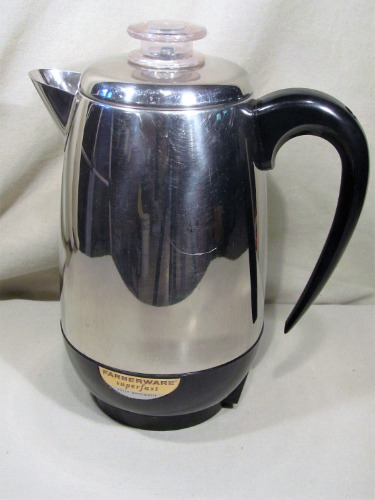 Have gone through 3 Chinese made Farberware percolators in quick succession, but I feel like this one is made to last. It was a pleasure too dealing with the proprietor Mr Caldwell who seems to really care about providing a good product at a fair price.